The El Dorado County Office of Education Charter Alternative Programs have launched a special college and career readiness program that provides the opportunity for Charter students to enroll in college courses while still completing their high school diploma. The program, which is offered in partnership with the Folsom Lake College El Dorado Center, allows the Charter students to take community college courses concurrently during high school while earning both college and high school credits. The El Dorado Center College and the Charter staff work together to provide a built-in support system. 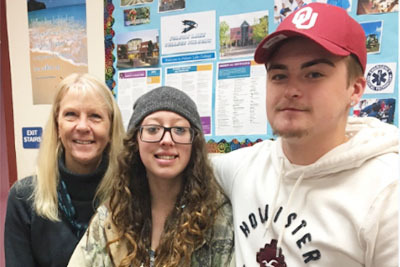 The team - which includes an Outreach Specialist from Folsom Lake College - meets with the Charter students twice a month to ensure students are successful, including developing an individual college plan for each student. Currently, 30 students from the Charter Community School and Charter Career Prep programs are registered in the Advanced Education program, which provides transfer opportunities to accredited colleges. The programs emphasize college and career readiness and success by utilizing a rich, engaging curriculum supplemented with a variety of strategies to get students thinking about, and involved in, planning their futures, including providing a variety of career aptitude assessments and hosting monthly guest speakers from local businesses and organizations, who help guide students toward a successful transition into higher education and the workforce. Classroom discussions focus on the opportunities in our area for young adults -- whether through internships, job training, or academic pursuits. The Advanced Education program is one of the many ways Charter Alternative Programs help guide students toward a successful transition into higher education and the workforce. The programs provide a variety of high quality, innovative, 21st Century programs that emphasize the development of the whole individual in safe and supportive learning environments. Additional information about Charter Alternative Programs may be found at Charter website or by calling (530) 295-2259.